More words of inspiration and strength from my friend and Captain in the Good Fight, Mairead Maguire. 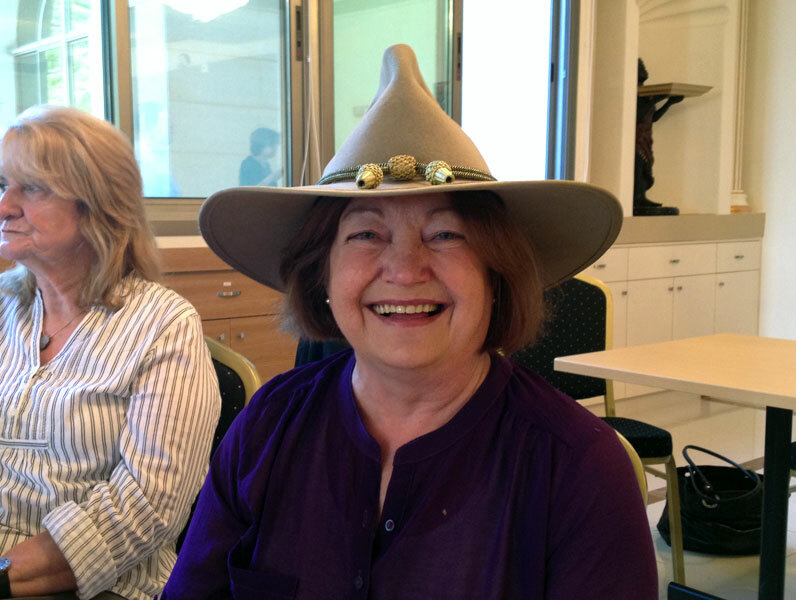 Every time I look at this picture of Mairead wearing my US Civil War battle hat I am reminded of the role that noble officers can play for troops in the front line. In the middle of the ‘fog of war’ we see them standing tall, and it strengthens the arm for battle – in this case for the non-violent battle for peace. Pope Francis has set Saturday September 7, 2013 as a worldwide day of prayer and fasting for peace in Syria. The Vatican has declared that it is against “armed intervention,” pointing to the havoc caused by the United States led war to topple Saddam Hussein in Iraq in 2003. I would like to add my support t Pope Francis’ appeal and pledge to pray and fast for peace on September 7th. I encourage people of all faiths and none to join that global day of fasting and prayer for peace, and to act for peace and against U.S. military intervention by the United States in Syria. One hundred years ago a small incident took place in Bosnia, and it escalated into the first world war, causing the death of millions. Every act has its consequences and every violent act, like the proposed U.S. military intervention, has its violent consequences which will cause the death of further Syrian civilians and result in many more refugees. In the last decade, the world has watched in horror as the U.S., the U.K. and NATO have used military intervention in Iraq, Afghanistan, Libya, and other countries. Now President Obama has promised a military intervention on Syria “with teeth.” In Iraq, we were promised military intervention with “shock and awe.” We have also been promised that he will continue to support the armed opposition in Syria (a majority of which are Jabhat al-Nusrah-Victory Front, and other such al Qaeda groups). Such U.S. military action, which will probably involve trying to destroy the Syrian army, will leave the civilian population unprotected from the onslaught of armed opposition forces. It will embolden and strengthen the thousands of Islamic extremists from all over the world who have poured into Syria. They are financially supported and trained by some western governments, and their intent to remove the Syrian Government and kill all those who oppose them. Their mission and aim coincides with that of the U.S., Saudi Arabia, and Israel—all of whom refuse to support Geneva II and a peaceful solution to the proxy war being perpetrated for oil, resources and control. Let us all support the peace movement by doing what we can–marching on Washington, speaking out, sitting in and engaging in nonviolent direct action to lobby U.S. political representatives to vote “No” to war. A large majority ofAmerican people are against this war. People around the world support those Americans working to stop this war. Mairead Maguire won the 1976 Nobel Peace Prize for her work for peace in Northern Ireland. This entry was posted in Uncategorized and tagged Congress No, Father Dave, Iraq, mairead maguire, Nobel Peace Prize, Northern Ireland, pope francis, syria, Syrian Government, United States. Bookmark the permalink.